Having worked with Deni at ArtSpex for many years, I greatly value her strong support for the design industry. Deni has always demonstrated unparalleled professionalism and proficiency with dedication that is unequivocal. From concept design to carefully analyzing defined budgets, she has proven expertise in guiding designers, like myself, in fulfilling all aspects of a client’s interests for any size project. 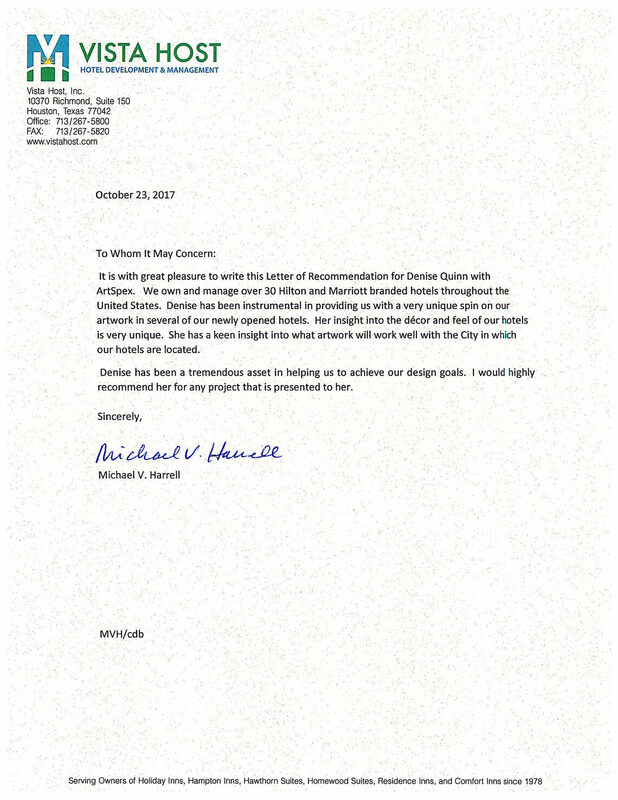 Deni goes above and beyond ordinary customer service. Deni is truly an asset to all Interior Designers! Thank you so much for the beautiful work you did, as always, on the artwork for the new hotel. It looks fabulous! The Hollywood icon collection in the bar really makes a wonderful statement and captured exactly the ambience I wanted to create - thank you for your contribution to create this place with the frames that give to it a magnificent atmosphere. (# 1 Luxury Hotel in the World, Trip Advisor 2016). I have been a client of Deni's for over 15 years. Through the years she makes it easy for me as an Interior Designer who is always looking for the perfect art to enhance my projects. Deni and I have developed a great rapport over the years and she can always capture the essence of my clients' needs despite their varying spaces, tastes, or purpose for a piece which calls for custom images and oversized wall decor. Deni makes this simple by partnering with me, to achieve exactly what is envisioned. A big part of Deni's success is - she believes in open and realistic two-way communication throughout the creative process. A piece of her heart and soul is put into every project no matter the size because she loves what she does and enjoys the challenge to be constantly creative and think outside of the box. I have always given Deni creative freedom, and she has always surpassed my expectations.
" Deni contacted me to discuss the artwork needs for her high-end hotel client. Her patience, insights and communication skills are outstanding and delightful. We were able to put together a high volume solution within a very tight deadline that exceeded the client’s expectations. She has the rare ability to take stressful situations and turn them around into exciting, energizing challenges. I would jump at the chance to work with Deni on any artwork project in the future. She listens to the needs of not only her clients but also the artists and photographers involved on the project. " I have had the pleasure of working with Deni for over 20years. Her talents and resources to create complete art packages has proven to be an exceptional asset to our design firm. Deni’s people skills are also extremely beneficial when working with private clients - helping to facilitate art selections that clients can identify with- making our finished design a reflection of the homeowners. She’s fantastic! American Renal Associates I just wanted to say how beautiful the artwork looks in the new unit. The installers were absolutely wonderful. They were extremely professional and attentive to all my requests. They're beautiful.... Just perfect! Thanks again! The Open House wouldn't have been the same without the artwork. Politicians, and infamous people that come from Minnesota. More I look at pictures I continue to thank GOD I found you. You made the hotel. I wish I could thank you enough.